This is the final issue of MPT to be edited by David and Helen Constantine. It features the last of their inspiring editorial essays and a host of surprising and wonderful poems from all over the world. 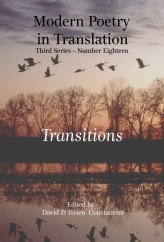 ‘Transitions’, is jointly edited by David and Helen Constantine and the poet and translator Sasha Dugdale, who will succeed them as Editor from 2013. So in that obvious sense this autumn issue is transitional. It addresses the whole concept of transition in as many ways as possible. First as it might be applied to the theory and practice of translation itself, the going across from one language and from one text to another, from native to foreign, to and fro. Some translators actually strive to make their translation a thing in transition, partaking of both worlds and hovering between the foreign and the native. Many feel translations to be always ‘transitional’, since most (unlike the texts being translated) date quickly, and have to be done again for new readers coming along in successive generations. More widely: if, as Heraclitus thought, ‘eveything moves and flows’, no writing true to life can desire fixity, let alone achieve it; and some poets have made a virtue of the fact that everything is in flux. In this issue translated poems, short essays, and anecdotes address the idea of transition. This volume celebrates movement, flux, change, the eternal (and hopeful) possibility of moving on out of forms and ways of thinking that have lost their liberating and enlivening force, and into new ones, that will work. By its very diversity MPT always has acted against set minds. ‘Transitions’ is proof and promise that it always will. Highlights include: Poems by Ko Un who is reading at the Aldeburgh Poetry Festival and whose collection First Person Sorrowful is appearing with Bloodaxe this Autumn. Julith Jedamus’s translations of Lorca’s Romances. New translations of Philippe Jaccottet by C K Stead and David Harsent’s poems after Yiannis Ritsos. East German poet Heinz Czechowski in fresh translations by Ian Hilton and Ken Cockburn.